SUMMARY: On a hot Atlanta day, 17-year old Charley goes to Target to return a skirt that is too short. While in the parking lot, Charley gets caught up in a wormhole that takes her to a beautiful and isolated island. There are other teens on the island, which appears to be located on earth. Charley discovers that the teens on the island have exactly 365 days from their arrival date to escape the island. If they cannot find a wormhole to take them home, they will die. REVIEW: After more than two weeks of trying to get into this book, I am giving up on page 137. It's not that interesting, and even more bothersome, Nil has an implausible premise. It appears that the wormholes bringing people to Nil are randomly placed throughout the world because there are cheetahs, lions, tigers, and zebras on Nil. There are also a few teens on the island from countries outside North America. But no matter where they are from, the only people taken through the wormholes are devastatingly beautiful teenagers. No elderly people. No screaming toddlers. No polished 50-year old corporate softie who cries himself to sleep every night. No one with a disability or a chronic illness. No one who has acne or bad teeth or athlete's foot. Seriously? With few exceptions, all the Nil hotties are really nice! Though there is at least one nefarious deed-doer, Nil is no Lord of the Flies. And you can easily spot the bad guy because he's the only one using the F-word. Other than that one boy, the teens on the island of Nil are polite, well-socialized, smart, work well with others, and are--let's not forget--so darn gorgeous! Oh, the loincloths! To me, this is sort of a bad version of Libba Bray's Beauty Queens. I didn't care for that book much, either, though I did at least finish it. The girls on the Beauty Queens island were also all gorgeous, but since they were all beauty pageant contestants involved in the same plane crash--at least that made sense. And the whole tone of Beauty Queens was satirical--it was far-fetched on purpose. It makes a statement about commercialism and corporate-sponsored "reality" TV. Nil--at least up to page 137--has none of that going for it. Oh yeah! There's insta-love! As if I needed another reason to DNF Nil. To be fair, I am linking a particularly insightful early review of Nil that is much more positive than mine. 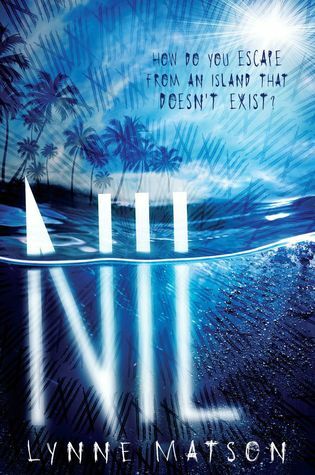 If you are thinking about reading Nil, know that I've seen several reviewers who said that Nil does take time to get started but gets better in the second half. Those reviews managed to get me all the way to p. 137--I was ready to abandon just after page 100. THE BOTTOM LINE: An implausible premise and a bunch of beautiful, goodie-goodie teenage characters drove me to DNF this one. For a better survival-romance story, read These Broken Stars instead. STATUS IN MY LIBRARY: We don't have it, and I have no plans to get it. Characters: 2/5--an island full of really nice hotties! Appropriate length to tell the story: 1/5--Too long for me!